Multi user login commonly know as Concurrent sessions gives you the advantage to allow multiple users to login to the same computer using a remote computer without disturbing other users using it. Concurrent sessions is a feature in server editions of Windows that lets more than one user to log on remotely and use the server at the same time. By default in Windows 7, Windows Vista and Windows XP when you connect to a computer using Remote Desktop it forces the person physically using the machine to loose his session. If you have concurrent session enabled on your Windows machine everyone can access the machine using Remote Desktop without hampering other users work. 1. 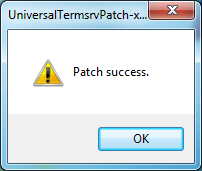 Download the Universal Termsrv.dll Patch by DeepXW and unzip it. I have tested this and it works fine without affecting your Windows OS or any other application. Multiple users are able to access the machine using Remote Desktop.